The British Astronomical Association (BAA) is the UK's largest body representing the interests of all those - astronomers and non-astronomers - who appreciate the beauty of the night sky and value it as a natural resource. The starry sky is, unofficially but indubitably, a site of special scientific interest and an area of outstanding natural beauty: if it can be seen. The Commission for Dark Skies (CfDS) was set up by concerned members of the BAA in 1989, to counter the ever-growing tide of skyglow which has tainted the night sky over Britain since the 1950s. Usually the result of poorly aimed streetlights and floodlights emitting light above the horizontal into the sky, skyglow is nowadays increasingly a result of vastly over-powered, poorly mounted household security lights and literally "over-the-top" sports lighting. CfDS has grown into a network of over 140 volunteer local officers, and several hundred committed supporters, who work to persuade their local councils and organisations of the benefits of well directed lighting, the motto being: the right amount of light, and only where needed. Why is CfDS is so keen to highlight the light pollution problem? These pictures show how the night skies have deteriorated over the last 50 years. 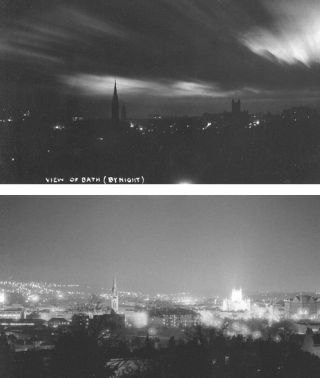 These 2 pictures (1950 & 2000) show exactly the same view of Bath, a small city in the UK's West Country. Through careless lighting, the night sky is now flooded with the orange glow of street- and floodlights. Light pollution is a world-wide problem.The good news is that the message from CfDS and the IDA is starting to be more widely accepted, and in some cases the trend is going into reverse as administrations and organisations begin to adopt a more environmentally sensitive approach to lighting and the environment. Should we put all the lights out? Of course not! We need the right amount of light, directed only where needed. We need light at night for many obvious reasons. Better lighting saves energy and therefore is environmentally friendly both to the skies, and to the atmosphere through the reduction in power requirements from fossil-fuelled power stations. Better lighting gives us back something like the dark skies that people enjoyed long ago. The light from the rest of the Universe takes hundreds, thousands or millions of years to reach our eyes. What a pity to lose it on the last millisecond of its journey!